What Makes The Jefferson in Washington DC Such a Unique Luxury Hotel? At the elegant and intimate Jefferson Hotel in Washington, DC, every guest is made to feel presidential. This jewelbox luxury hotel is located four blocks from the White House, which can be glimpsed from the top-floor Jefferson Suite. 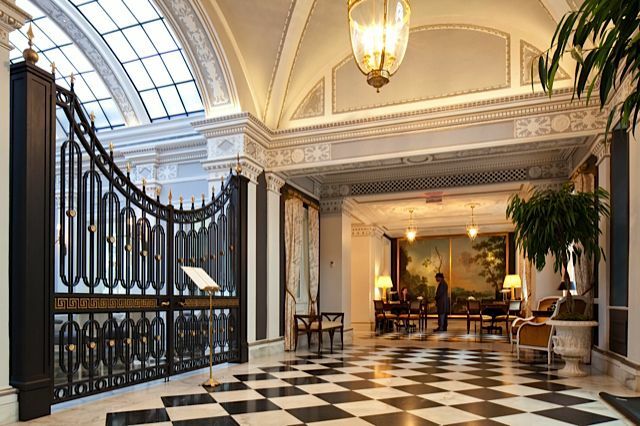 The Jefferson is a top choice of discerning luxury travelers to America's capital. This private-feeling, 99-room property is a refined luxury hotel. • In 2014, the hotel's restaurant, Plume, won the rare Forbes five stars. One of the first things you notice when you enter The Jefferson's lobby is what's not there: no newsstand, no shops, no check-in counter or conventional front desk. Instead, right in front of you is a set of wrought-iron gates suggesting a mansion's portal. Just beyond the gates, you see a barrel-vaulted skylight. This delicate structure was long-forgotten and uncovered in the hotel's 2007-to-2009 renovation. The skylight dramatically frames the Greenhouse, a bright, lovely breakfast room flanked by limestone fountains. To your right, in an alcove before a 19th-century mural of a pastoral landscape, are two splendid antique desks such as you might see in the library of a manor home. Each desk faces a pair of upholstered wood-frame chairs. Everything about The Jefferson is designed to foster the lovely illusion that you are a guest in a gracious private home. This home, you sense, belongs to a person of considerable wealth, refinement, and quiet charm. A person who happens to fill her home with art and memorabilia relating to the third President of the United States. Actually, this isn't far from the truth. That person is Constance J. Milstein, a prominent Washington attorney, entrepreneur, and philanthropist. In 2006, Connie, as she is called, bought what was then the Jefferson Hotel through her company, Ogden CAP Properties. A hands-on owner, she proceeded to guide the hotel through a renovation that amounted to a transformation. One of the charms of The Jefferson is that it is small, a true boutique hotel of just 99 accommodations: 82 rooms and 17 suites. Rooms feel very private, and are wonderfully quiet. There is extreme attention to detail here. Furniture and bedding are of exceptional quality. Sheets and duvets are made of high thread-count French fabrics. Bathrooms feature oversized walk-in showers and hand-cut Italian stonework; some bathrooms have deep soaking tubs. Rooms and suites have many classical touches, including coved (recessed) ceilings and moldings with antique intaglios. Beds' headboards and footboards are upholstered in leather. For all its reverence for the past, The Jefferson is high-tech. A holographic TV screen is imbedded in the bathroom mirror (a little distracting when shaving). When switched off, the screen reverts to a mirrored surface. Instead of hanging a "Do Not Disturb" sign on the door, you press a button that turns on a discreet light outside the door. Every room is equipped with a flatscreen TV, Bose radio with iPod dock, and wifi. If you're the type of luxury traveler who'll trek clear across a city in pursuit of great food, it's nice for once to let others run up the cab fare. One of the District's most sought-after tables is just an elevator ride away for guests at The Jefferson. Plume conveys "important restaurant." Its distinguished design employs tall classical columns, an ornate central chandelier, and candelabra-like wall sconces. Yet Plume's privileged atmosphere is not in the least stuffy. The restaurant's aura is intimate and romantic, its menu and wine list sophisticated and gently adventurous. Plume's service -- alert, informed, invisibly efficient — is overseen by a reassuring captain who ensures that diners are treated to flawless service. Plume makes it easy to leave your cares at the door. Executive chef Chris Jakubiec's food is simply exquisite. The ways in which he harmonizes flavors and contrasts textures feel just right. Plume's three-course tasting menu offers many choices of appetizers, entrees and desserts. It also includes an amuse-bouche and post-dessert petit fours. My dining companion started with an ineffably light soft-shell crab tempura with blood orange emulsion and curry powder. As to my appetizer, sometimes I like to try dishes that sound underwhelming just to see what the chef can do with them. I chose Jakubiec's raw and cooked vegetable salad, and the answer was "a lot." Served with zucchini marmalade, seasonal truffles, and verjus dressing, it was refreshing and light, yet more complex and engrossing than most salads dare to be. There was nothing retro or clichéd about the intense lobster thermidor my companion had as her entrée. I went with chicken, that overly familiar protein, again to see what the chef could do with it. And again Jakubiec delivered. His "truffled avian poularde" had the perhaps unfair advantage of being a plump hen, not an ordinary chicken. The bird was marvelously moist, flavorful, and crisp-skinned, with a supporting cast of seasonal mushrooms, potatoes Parisienne, and baby leeks that flattered the star. Pastry chef Fabrice Leray's desserts were so good we ordered a third after we finished the first two. We polished that off, too. The Jefferson's lounge, Quill, is cushy, with a sensuously curvy bar. It's made of a glassy composite that glows orange like a jack o'lantern. The black barstools are light-hearted, too, which is how you may feel after a couple of Quill's captivating, exactingly concocted signature cocktails. Ahh, breakfast. When done right, as it at The Jefferson, it can be the best meal of the day. It doesn't hurt that the Greenhouse perches scenically under the hotel's restored glass skylight. At the Greenhouse, the bacon is just a little meatier, the lemon ricotta pancakes a little more flavorful and substantial, the lobster eggs Benedict with sauce choron a little more indulgently luxurious than they need to be. Which is why I awoke my second morning at The Jefferson looking forward to another breakfast. The Greenhouse also serves lunch, brunch, afternoon tea and dinner. If you don't have the time or appetite for a full breakfast, complimentary tea, coffee, and dainty breads and pastries are laid out on a handsome sideboard near the elevators. Room service at The Jefferson is 24 hours. The Jefferson's spa is small but well equipped. It comprises three treatment rooms (including a couple's suite) plus a manicure/pedicure area and hair salon. The spa has a steam shower but not what you could call lavish locker rooms. Many types of massage, facials and body treatments are available for men and women. Some specialty treatments: deeply moisturizing hydrofacials, aromatherapy, and vinotherapy based on salubrious red grapes. Gents can settle back in an old-fashioned barber chair for an equally old-fashioned straight-razor shave. What's more, if you've always wondered whether you'd look as cool with a shaved head as, say, NBA hero Lamar Odom or WWF star "Stone Cold" Steve Austin, this is the place to find out. Never fear: the Jefferson's master barber reads skull contours like golfer Rory McIlroy reads putts. Whatever spa or barbershop treatment a guest chooses, the spa experience begins elsewhere: in your Jefferson hotel room or in the Book Room, with a beverage and a treat from the kitchen. Then a spa valet escorts you to the spa. Following the spa treatment, you find a toiletry keepsake waiting in your room. The mirror-walled fitness room is small but serviceable. There are two treadmills, two elliptical trainers, a stationary bicycle and a rack of dumbbells. ...The Jefferson has an arrangement with the prestigious University Club of Washington DC, less than one block away. Hotel guests can use the club's fitness facilities including its lap pool, squash courts, and locker rooms. There is no charge for this gracious service. The Jefferson doesn't just look important. It has, in fact, been an eminent establishment since the day it was built. A superb example of Beaux Arts architecture, the eight-story building was designed by Jules Henri de Sibour and opened in 1923 as the Jefferson Apartments. It quickly became a high-status residence for society and government elite. Converted into the Jefferson Hotel in 1955, it attracted so many diplomats, former presidents, and foreign heads of state that it was nicknamed "White House North." Until he joined CNN, Larry King broadcast his topical talk show from a room at the hotel. Much of the interior was gutted in the recent two-year renovation, and every room and suite reworked. New public spaces were created, including Plume and The Greenhouse restaurants, Quill bar, a spa, a fitness room and several imposing meeting rooms. And the word "hotel" was dropped. Since reopening in 2009, the property has been known simply as The Jefferson. Thomas Jefferson, noted philosopher and principal author of the Constitution, would have appreciated the conversion of the former lounge into what is now the Book Room. Beautifully appointed with leather sofa, comfy armchairs, brass lamps and a fireplace, the Book Room is a wood-paneled, volume-lined sanctuary, holding more than 800 vintage leather-bound tomes as well as signed copies of books by modern authors who have been Jefferson guests. There are few better places to relax and read, nurse a Cognac or just gaze up at the illuminated shelves and contemplate the lifetimes of learning collected there. In a compelling yet unobtrusive way, The Jefferson honors its namesake wherever you turn. Documents signed by Thomas Jefferson are displayed in the concierge's corridor on the ground floor, along with a reproduction of a bust of the Virginia-born president by Jean-Antoine Houdon, the leading sculptor of Jefferson's time. In the guest rooms, draperies and bedspreads depict Monticello, the home Jefferson designed, in copyrighted toile patterns designed for the hotel based on textiles that Jefferson, a French-speaking Francophile, brought back from Paris. Many of the hotel's rooms contain a framed Jefferson aphorism, reproduced in his calligraphic hand, with signature. The hallways are filled with framed period prints of American pastoral life and the natural wonders of the still-untamed continent. The wood-paneled private dining room known as the Private Cellar, lined with illuminated wine cabinets, features a Jeffersonian invention — the dumbwaiter — for bringing up bottles from the actual cellar. The Jefferson's Madeira collection works its way back through two centuries and dozens of vintages. The oldest bottle is dated 1780. Jefferson was 37 then, his presidency still 21 years in the future. Will You Like The Jefferson in Washington DC? As is common in the travel industry, the Guest Author was provided with a complimentary visit for the purpose of describing the hotel. While this arrangement did not influence his article, About.com believes in editorial transparency. For more info, see our site's Ethics Policy.